The four-year ongoing armed conflict between Ukrainian authorities and Russia-backed militias in the Ukrainian Donbass region has already led to some 10,000 killed and 25,000 wounded civilians. Among them, over 1,600 residents died or were injured as results of detonations of unexploded ordnances or mines. Currently over 2m civilians, including 220,000 children, live at or in a close proximity to lands contaminated with unexploded ordnances and /or anti-personnel landmines. Landmines particularly contaminate mostly agricultural land plots, territories adjacent to roads and civilian areas, with almost no corresponding signs installed. Though conflict sides conduct limited mine clearance operations regularly, the overall number of mines is unlikely to decrease due to constant deployment of new ones. Acting Ukrainian legislation also creates additional bureaucratic barriers, as it restricts significantly international organizations from actual mine clearance operations. Anti-personnel mines are victim-activated weaponry, which, once activated, results in severe injuries, firstly limbs shattering and amputations. Despite the initially planned primary impact of the weaponry (to injure, not kill, military opponents with a view to inflicting additional logistical and medical burdens), up to 80% of all casualties from anti-personnel mines occur among civilians. In 2016, 2,037 individuals in Yemen and 1,610 others in Libya were injured by explosive remnants of wars, leading to significant social, psychological and economic impairment for victims. With a view to firstly protecting civilians, the Convention on the Prohibition of the Use, Stockpiling, Production and Transfer of Anti-Personnel Mines and on their Destruction was developed. The destruction of all anti-personnel mines in mined areas under the country’s jurisdiction or control no later than ten years after the ratification of the treaty. 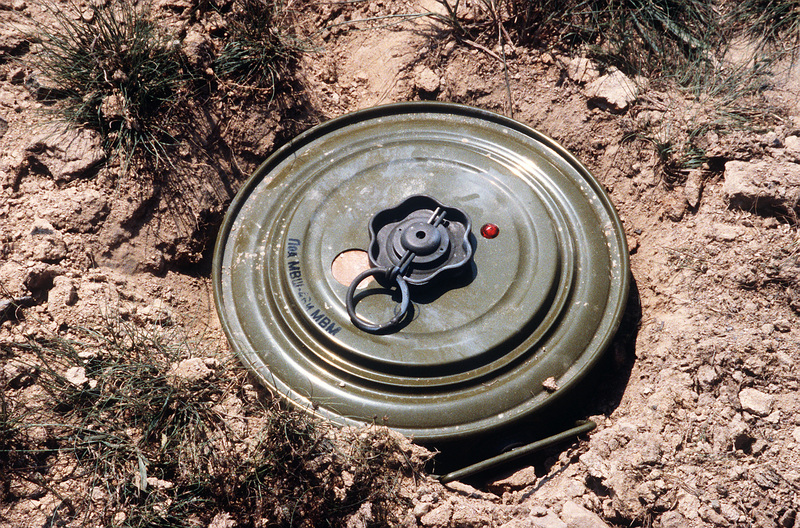 Article 5 on the destruction of anti-personnel mines in mined areas: Ukraine missed this deadline on 1 June 2016 without having requested its extension. A military conflict in the Ukrainian Donbass region started in early 2014, following the annexation of the Ukrainian Crimean peninsula by the Russian Armed Forces. In Donetsk and Luhansk regions, both located in Donbass geographical area, local separatist groups, reportedly supported financially and military by the Russian authorities, not only supported the annexation, but also attempted to repeat such a scenario and soon declared their independence from Ukraine, launching military confrontation with the Ukrainian army with large-scale usage of aviation, rocket artillery and armored fighting vehicles. At the pick of the conflict, up to 60,000 Ukrainian servicemen and around 33,500 DPR and LPR militias along with up to 12,000 Russian servicemen were reportedly participating in the armed conflict in the Eastern Ukraine. During the active phase of the confrontation the line of contact between fighting sides changed constantly, leading to the larger contamination of the territory with various types of ammunition used by both the Ukrainian army and the separatist groups. The international Minsk peace negotiations in 2014 put an end to the large-scale military operations in the Donbass conflict zone. However, the armed confrontation between Donetsk and Luhansk breakaway republics (parts of the Ukrainian self-titles regions) and the Ukrainian authorities has been since continuing, with daily shootings and constantly growing number of killed and wounded individuals, including civilians, from both sides. In 2014, the Ukrainian authorities lost control of over around 45,000 square km (an area exceeding the size of Switzerland), following their occupation by the militia groups later-named as Donetsk People’s Republic and Luhansk People’s Republic (here and after – DPR and LPR). Numerous attempts to regain control over territories, mostly conducted by the Ukrainian army, has led to further increase in land contamination with various unexploded ordnances (UXOs) and mines, including anti-personnel. The actual extension of anti-personnel mines’ contamination in the Donbass conflict zone is undeterminable, partially due to the ongoing military confrontation. Even the officials provide significantly dissimilar assumptions. In 2015, the Defense Ministry said that around 37,000 square km of the territory of both Donetsk and Luhansk republics had been contaminated with UXOs and mines, mostly alongside the 457-km line of contact between the army and the DPR and LPR militias. 21,000 square km of this territory were government-controlled areas and the rest 16,000 square km were the occupied territories. Though, in 2018 the potential impact were recalculated and the Defense Ministry assumed that smaller area, namely, 7,000 square km of the government-controlled territories and 9,000 square km of the occupied Donetsk and Luhansk regions plus Russia-annexed Crimea had been potentially filled with unexploded remnants of war. The responsibility of any conflict side for the usage of anti-personnel mines is also unlikely to be established, partially for the same reasons of the ongoing armored confrontation. Officially, the Ukrainian authorities has signed in 2005 a Mine Ban Treaty, prohibiting the usage, as well as production, acquiring, stockpiling or transferring of anti-personnel mines. The current Ukrainian authorities deny usage of anti-personnel mines in the Donbass conflict zone, accusing the DPR and LPR militias of laying them. Several international NGOs confirmed such claims (the 2017 Landmine Monitor attributes the usage of anti-personnel landmines only to Ukrainian non-state armed groups); however, it contradicts the data of the UN Office of the High Commissioner for Human Rights. In 2016, it reported that both the armed forces and the separatist groups laid landmines, including anti-personnel ones. The OSCE Special Monitoring Mission (OSCE SMM) in its unofficial conversations also says that all conflict side by this time continue to lay mines along the line of contact, allegedly in preparation for large-scale offensive operations. To prevent possible explosions and legal consequences, both sides even reportedly regularly pull mines out of the contaminated territories, to let the OSCE SMM to pass through for its field inspections, and then installed them back, once the inspection is over. The large-scale contamination maps, with the mines’ precise locations, their amount and types, however, do not exist. According to Donetsk region deputy governor Vilinsky, individual units of the separatist militias, who deployed significant number of weaponry, often conducted such operations secretly from each other, resulting in regular detonations and, thus, casualties among militiamen. The army classified numerous of its missions in the region as well. The contamination landscape has been worsened additionally by significant changes in the line of contact and constant surface’s layers movement as a result of rains, impact of underground water and snow melting. It is estimated that the mostly contaminated areas are currently agricultural land plots, civilian areas and territories adjacent to roads, including those near the border checkpoints. In 2016, near Marinka, Donetsk region, a minibus, while bypassing along a roadside a vehicle queue, drove over mine, which detonated and killed four individuals. No contamination signs were installed there, as well as still in the majority of such areas. All anti-personnel landmines reportedly deployed in the Ukrainian Donbass conflict zone originated from the Soviet Union or Russia. Ukrainian authorities regularly find and seize anti-personnel mines of the following soviet-produced types: MON-series directional fragmentation munitions, OZM bounding fragmentation mines, PMN blast mines and POM scatterable mines. Unlike Ukraine, Russia did not sign the 1997 Anti-Personnel Mine Ban Convention and reportedly still possesses 26.5m of anti-personnel mines. Furthermore, the Russian Emergency Situations Ministry regularly sends humanitarian convoys to the occupied Donetsk and Luhansk territories without allowing international monitors to inspect them. On 24 May 2018, the 77th Russian convoy of over 40 lorries with 400 tons of cargo, including allegedly baby food and relief supplies, entered the militias-occupied territories. Earlier in February 2018, similar amount of Russian supplies marked as humanitarian ones had been transferred to the occupied territories. This time, monitors of the OSCE SMM attempted to attend the unloading of 10 convoy trucks, which were entering a compound on the outskirts of Luhansk. However, the OSCE SMM patrol was blocked by armed militiamen prohibiting their entering. Even the lowest estimations indicate that at least 16,000 square km of the territory of the Ukrainian Donbass conflict zone are contaminated with anti-personnel landmines. To date, 50 minesweeping squads, or nearly 300 personnel, formed from representatives of the Ukrainian army and international demining organizations examined only 260 square km (3,7% of all potentially hazardous area) and found and neutralized over 340,000 unexploded ordnances and landmines. The majority of demining activities, however, were concentrated alongside the line of contact between two combating sides, especially close to the infrastructure facilities, such as water and gas pipelines, transmission lines, railroads, etc., leaving aside most of agricultural land plots, which have been actively used for the anti-personnel mines deployment and are currently used by residents for agricultural purposes. Despite regular detonations of war remnants on agricultural fields (the OSCE Special Monitoring Mission registered at least three such explosions in April 2018), residents insist that they will continue to cultivate contaminated land plots. Financial costs. Clearance costs of one anti-personnel mine vary from EUR300 up to EUR1,000 depending on the terrain, accessibility, industrial waste in the ground, etc. The Ukrainian Defense Ministry roughly calculates the required funds as over EUR650m (calculations are based on the amount of funds invested in the demining programs in Croatia). As the Ukrainian authorities are unlikely to allocate such sum for the Donbass demining, several foreign governments and supranational organizations, such as NATO, EU, OSCE, UN, have already expressed their readiness to finance mine clearing activities. Still, such financial support is restricted partially due to the incompatibility of local legislation. Legislation. There is currently no official body fully in charge of the mine clearance activities in the Donbass conflict zone. The Ukrainian Defense Ministry is responsible for demining of 5-km buffer zone stretching from the line of contact to the government-controlled territories. The rest of the area is related to the State Emergency Service. Due to the limitations set by the current Ukrainian legislation, particularly lack of the accreditation procedures of mines storage and transportation by international non-state-actors, mine-related activities of international organizations are strictly limited. Three international demining organizations, working currently in Ukraine, namely, Swiss FSD, Danish DDG and British HALO Trust, are formally allowed only to examine potentially contaminated territories. Upon detection of UXOs or mines, they have to contact the State Emergency Service for explosive’s neutralization. Parliament initiated developing of the national legislation on mine clearance in Ukraine and was supposed to table a corresponding draft law in January 2018. The issuing, however, was postponed, as reportedly several major provisions were still under discussions, such as the taxation regimes for equipment used for the land demining. No guarantees. The Ukrainian authorities occasionally accused the DPR and LPR militias of laying new mines on the Ukrainian-controlled territories as acts of sabotage. On 15 November 2017, near Talakivka, Donetsk region, a police vehicle drove over a landmine, which detonated and killed one police officer and wounded two others. A day before the same road had been reportedly used by the police or army forces with no incidents occurred. At least 2m civilians, including 220,000 children, currently live at or in a close proximity to lands contaminated with unexploded ordnances and landmines. To that end, demining campaigns should firstly concentrate on publicly used lands, such as villages, agricultural land plots and territories adjacent to roads and checkpoints along the line of contact. Contaminated territories can be used for regional economic development, for instance, agriculture. In 2017, agriculture provided over 40% of Ukrainian export and 14% of its GDP, employing over 5% of workforce. Additionally, according to the Ukrainian parliament, private subsistence farming households ensure supplies of over 75% of dairy products, 40% of meet and around 40% of eggs on the domestic market. If land plots are cleared, local residents will be able to use them for subsistence farming, a measure significant for a country with a minimum wage of EUR100 and especially for regions close to the ongoing armed conflict. Early launch of demining activities can ensure both financial support from international and supranational organizations and facilitated and secured clearance of territories. As there are currently no ways to even approximately calculate the number and extension of anti-personnel landmines in the Donbass conflict zone, the early start of demining activities would provide minesweeping squads with facilitated access to the explosive remnants of armed conflict in the Donbass conflict zone. This text was first published in Ukraine-Analysen Nr. 204 on July 15, 2018.